This article starts a new series featuring tips for designing your basement’s interior. By incorporating the unique features of your basement into your design choices, you can produce a finished basement that is both beautiful and functional. Basic elements such as support columns or posts, exposed overhead joists, water and sewer pipes, air ducts, and the home’s water heater and furnace provide opportunities for creativity as you fit them into your finished design. Pressure-treated wood is a good choice for areas that are in constant contact with the basement’s bottom surface and outer walls. Moisture-resistant crowns, trim molding and flooring help create a finished basement that is durable and worry-free. Add cement-core insulated wall panels to provide comfort and reduce heating costs. 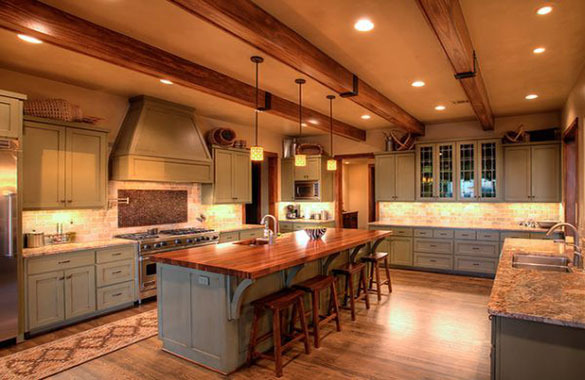 One popular trend is to used exposed wood beams. If the basement space provides adequate height for both a finished ceiling and an elevated subfloor, frame to provide airspace between the current basement floor surface and the new subfloor. The airspace helps insulate the finished basement and prevents moisture from entering the basement’s interior. If thick air ducts interfere with basement height, consider changing them to thinner ducts. If the basement floor is uneven and you do not have enough space to add a level sub-floor, use the “stick framing” method to construct your walls. This method requires that the basic floor and ceiling surfaces be completed before wall construction starts. Secure the top and bottom framing boards to the ceiling and floor, then cut each wall stud to size and toenail it in place. Frame around any obstructions. To add beauty to your basement and provide continuity between it and the rest of the home, incorporate a few features from the main floor into your design. If you really like the oak door and window trim found in your home, for example, continue the theme downstairs. Perhaps arches are a part of your home’s allure. Think of locations in the basement that offer the opportunity to beautify with arches, such as above the basement’s egress windows. If your basement ceiling is low, consider recessed lighting. Ceiling lights installed along the edges of the basement’s entire perimeter give the illusion of more space and provide an airy atmosphere. Add strategically placed mirrors or glass artwork to reflect light and increase charm. To create a crisp, clean look, choose white or very light colors for the basement’s walls and ceiling. Accent with wall trim, floor coverings and furnishings. Experiment to see what lines and patterns work best. Used sparingly, straight horizontal lines make your basement appear larger. Vertical lines give the illusion of added height.